The Lumia 950 and Lumia 950 XL provided the answer to the platform's fans starved for quality hardware and the complete flagship experience. The budget-friendly Lumia 550 that launched alongside didn't get as much attention, but served its purpose just fine - introducing the new Windows 10 to the masses. Now, everyone will agree this is far from a complete lineup and, a few months later, Microsoft is ready to do something about it. The Lumia 650 is a gorgeous looking phone - we can't think of a better way to start filling the blanks. It is amazing how much of a style difference a bit of metal can make. The Lumia 650 looks much more refined than any Lumia device to date (including the Nokia Lumia 830, which too flaunted a metal frame). Actually, we might as well go ahead and say it - the Lumia 650 looks better than its flagship siblings, the Lumia 950 and 950 XL. So, if all that hotness is available for less than $200, what's the catch? To put it gently, the internals don't quite do justice to the classy exterior. A punchy AMOLED screen does wonders for the overall impression - it's a Windows phone after all with plenty of black throughout the UI - and that's actually not where the good stuff ends. A solid 16GB of inbuilt storage is good enough to get you started and for everything else, there's a memory card slot. A fairly wide selfie camera is on the plus side as well. Unfortunately, the product team didn't have much budget left after these had to resort to using entry-level hardware, which has resulted in a rather unbalanced end product. 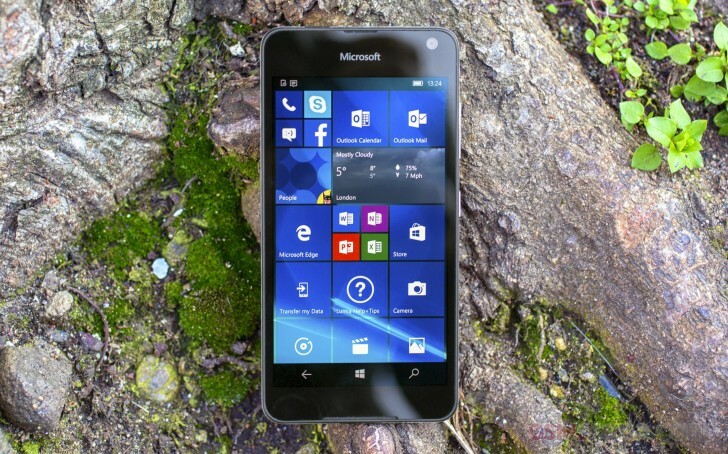 It's not that the raw processing power is not enough - Windows smartphones are known to be quite frugal. But the choice of chipset has limited other aspects of the phone experience - the absence of 1080p video recording is one of them. Obviously, LTE support was a higher priority than high-res video for the intended markets and demographics. Anyway, the compact and sturdy Lumia 650 will certainly get a lot of attention from budget-conscious users. We'll have a look at what you will be getting with the Lumia 650 on the following pages. This review is a little shorter than usual but hopefully sharp and to the point.